Des, a good and loving man, died peacefully at RUH on November 28, 2018 with his family at his side. He was predeceased by his parents Sarah and George Fey; his brother Austin; his two half sisters in England, Dorothy and Rosina; sisters and brothers-in-law, Ruth and Gordon Scilley; Gertrude and Earl Crofford; Evelyn and Douglas Crofford. Des is survived by his wife, Kay, and son Regan (Karen and her children Kiri, Lauren and Nyal); daughter Kendra Kuse (Craig) Ahnika and Jarryd; sister-in-law Beverley Savage (Harry Hudson); sister-in-law Edith Bannister; as well as nieces, nephews and cousins in both Canada and England. Des, born in Weyburn, SK, received his schooling and then trained as a Psychiatric Nurse at the Saskatchewan Training School. He transferred to Moose Jaw in 1955 to what is now Valley View Centre. In 1967 his career changed direction and he joined the Social Services Department and in 1969 the family moved to Saskatoon where he worked with communities developing services for people living with developmental disabilities. While working, he undertook part-time studies at the University of Regina in the School of Social Work, convocating with a BSW. 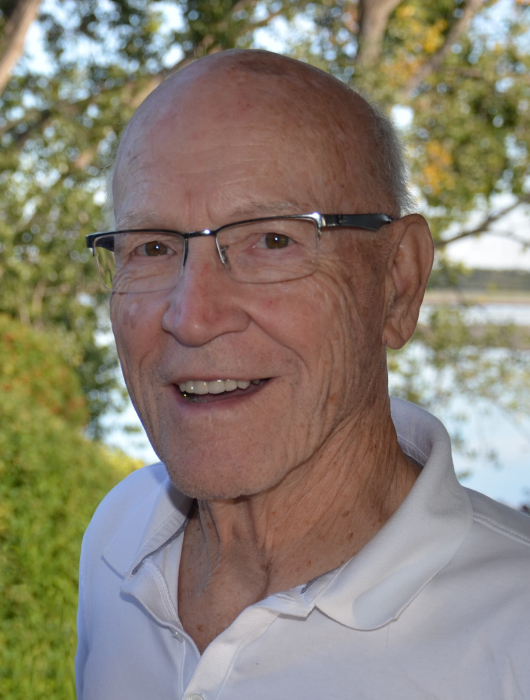 He retired from the Government of Saskatchewan in 1987 and then he joined the Saskatchewan Abilities Council as a Counsellor until retiring again in 1998. From 1950 to 1970, Des was a drummer in a variety of dance bands, playing weekend dances in Weyburn and Moose Jaw. Des and Kay enjoyed travelling to Mexico, Europe and visiting his family in England. They were charter members of the Cosmopolitan Couples Club, remaining active with the now Cosmopolitan Club of Saskatoon. Throughout most of his life, Des was an avid fitness enthusiast, enjoying running, swimming, and a variety of different exercise classes. In the last few years, he particularly enjoyed working out and walking with his good friend, Rueben Wiebe. Thank you, but no flowers please. If you wish, a donation to a charity of your choice, or to the Cosmopolitan Foundation Canada, Inc. c/o Terry Down at 419 David Knight Lane, Saskatoon, SK S7K 3M5 for research to find a cure for Diabetes would be appreciated. A service celebrating Des’ life will be held at Emmanuel Anglican Church (609 Dufferin Ave.) in Saskatoon on Tuesday, December 4, 2018 at 1:30 p.m. Arrangements are in care of Mourning Glory Funeral Services (306) 978-5200 www.mourningglory.ca.